Nigel Farage, who markets his UK Independence Party as a grassroots brigade immune to vested and corporate interests, has been revealed as courting hedge funds and City of London investors to fund his challenge to the mainstream parties. 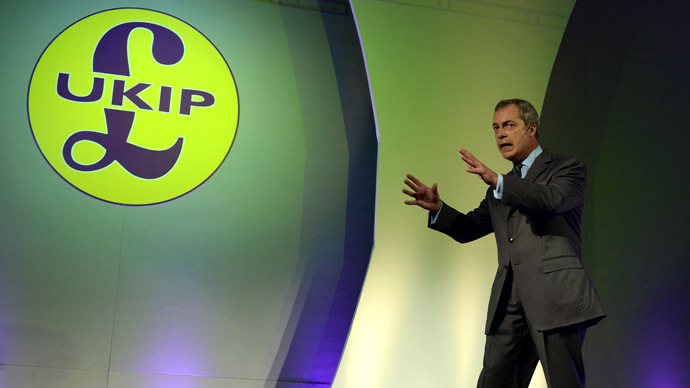 Although the euroskeptic UKIP leader has publicly claimed he hopes to create a “peoples party” independent of corporatism, he privately encouraged his party affiliates to forge relationships with influential City tycoons. He also referenced a meeting with a Swiss billionaire businessman, while encouraging UKIP members to capitalize on the party’s improved position in the polls and reach out to leading financiers. The controversial statements came to the public’s attention following the disclosure of an internal party report dated September 3, 2012. The leaked document undercuts arguments espoused by UKIP members who claim the Conservative Party relies on the City of London as underwriters. Since 2012, UKIP has secured the support of many gilded donors from the City of London. One noteworthy financier is Andy Brough, a leading fund manager at global asset management company Schroders. The firm manages £276.2 billion for institutional and retail investors across the globe. Brough joined UKIP’s ranks when his dissatisfaction with the coalition government and Europe’s regulatory jabs at the City of London reached a tipping point. Another hedge fund tycoon that backs Farage’s party is Crispin Odey, who runs Odey Asset Management. The investment mogul famously awarded himself a handsome £28 million in 2008, despite an unstable financial climate at the time that culminated in a crippling credit crunch. The prominent investor’s former father-in-law is the world’s most prominent TV and newspaper baron, Rupert Murdoch. While Odey is not an explicit member of UKIP, he reportedly hosted a fete in early 2014 in what appeared to be an effort to introduce Farage to possible donors and supporters. A co-founder of a leading hedge fund, Jo Hambro, offered UKIP a sizeable £50,000 donation last year. The investment mogul, whose £200 million portfolio of assets landed him in the Sunday Times Rich list, previously donated to David Cameron’s Conservative Party. Despite UKIP’s efforts to gain the support of influential City of London financiers, the Conservatives remain the primary benefactors of hedge fund firms and their proprietors. UKIP’s finances have grown markedly over the past two years, however. For the first time in electoral history, the euroskeptic party outspent Ed Miliband’s Labour Party in last May’s national council elections. UKIP also spent almost three times as much as Labour in the 2014 European election, and now stands as Britain’s biggest party on the EU stage with 24 representatives in Brussels. UKIP insiders say the party’s finances are robust in the run-up to May’s general election, according to The Guardian. UKIP declined to comment on the leaked report. A party spokeswoman said it was not policy to discuss internal documents that had been leaked to the public.